So, if anyone is interested in watching me and my pals play this game, check it out! You can hear my voice and my opinions almost in person. Lost? Check out the Table of Contents. So I booted up the game, right in front of the entrance to the Ossa Trail. It’s a simple winding path that goes up, then back down a mountain. Not far in, we encounter an assassin! It’s a young woman, and she seems to be after the blood of the chosen. As you can tell, she isn’t all that intimidating as far as assassins go. Worse, Colette trips (as usual) and hits a lever, opening up a service hatch for the mountain mines. Sheena falls, and is no longer a problem. The party continues. At the end of the trail, however, she comes back, running out from a cave opening, and we fight a miniboss, Sheena and her guardian spirit thingy. I’ll note that the cave is a sort of side dungeon, the boss being the Sword Dancer. I did not choose to grind enough levels to fight the sword dancer, instead I intend to return later. So, we reached the small port village of Izoold, and mess around in there a bit. Izoold is probably the easiest place to get stuck in the whole game, outside of a few dungeons. Unbelievable! Essentially, the party has to get across the ocean so that they can get to the water seal. Max has the only boat, but he’s too scared to cross. Luckily for us, he’s smitten with a girl name Lyla, so the part talks to her. Well, it turns out it’s not that easy either. She just goes on about some Aifread, who apparently is a pirate. Well, it turns out you have to talk to some random guy, who tells you Aifread’s in his hometown Luin. Then you can tell Lyla, and then she’ll want a letter delivered to him. She’s the one who forces Max to take you and the letter across to Palmacosta. Geez. Well, Palmacosta seems to be a large city, big shops line the port. I would have loved to buy some items, but I actually spent all my money back in Izoold on seaweed and barley rice… for riceballs. Instead I did a bit of weapon and armour upgrading at the customization guy. Customizing is free. So, continuing into the town, we encounter what looks to be another adventuring party. Colette knocks into them, and we spill their precious Palma Potion. Well, we’ll have to get them a new one. Lloyd isn’t too happy about this, because the other adventurers are pretty rude about the whole ordeal. Well, in looking for a place that sells the potion, we encounter Governor-General Dorr. He seems to be intent on fighting against the local ranch. There is not non-aggression treaty here, instead Dorr has organized a town army, a militia! I decided to learn more about this Dorr, so we headed into his office. It turns out that they have a book, a record of Spiritua’s journey through Sylvarant, where she hit all the seals. Well, they had a book. It turns out that apparently the chose and their group had already come here and gotten it! What? Dorr calls the guard in, and in moments the party is blocked from escape by ten or twenty armed guards! Colette falls, accidentally revealing her angel wings. Luckily, Neil, the assistant, calls off the guards. Sparkling wings clearly state that this group is not the imposters. It seems that they gave the book to the wrong group, to a bunch of fakes! Genis gets mad, and starts to show his racist side. See, Genis, being an elf, looks down on humans Raine smacks him before he goes too far. Let down, the party exit after many apologies from the General. We found a shop called “Marble’s.” Inside a girl named Chocolat is yelling at a couple of Desians. They seem to want to get some gels for a discount price, and she’s refusing them. What a sight! Thinks Lloyd, someone’s standing up to the Desians! They leave, threatening to tell Lord Magnius about this event. Afterwards Chocolat goes off to work. She’s a pilgrimage guide. We talk to Cocoa, Chocolat’s mother, and owner of the shop. She apologises for what happened, and then we shop! I see the Palma Potion on the list, it’s 1000 gald! Wait, I can’t afford that! I spent all my money on rice ball ingredients! Well, I sell a Beast Tooth and buy the potion, heading back to the adventurers. After a few rude remarks, they leave, seemingly satisfied. Then the party realizes that that group, those adventurers that had been so rude, they were the imposters! We exit grumpily, looking for the next seal. We head north. It seems that there’s a mountain blocking our way. The only way over is through a guarded path, and passes cost 100,000,000 gald! I don’t have enough for that, I bought seaweed and rice! And I don’t have 100,000 beast fangs to sell either! What a mess. Lloyd complains as we exit, and someone approaches is. It seems that Desians have attacked Palmacosta! Magnius is planning on making an example of the pesky shopkeeper from earlier with a public execution! They need the Chosen One’s help. Unable to allow preventable suffering, Colette chooses to go back south and help. I’ll get to what happens next later! P.S. Check out what I plan to do with Tales of Symphonia, or the Table of Contents. Also, if you’re interested in buying the game, be sure to use one of my affiliate links: PlayStation 3, or GameCube. This post reaches from the first arrival at Triet, to the Slyvarant base, to the Seal of Fire, and then ends right before the Ossa Trail. After a short romp south, stopping at a House of Salvation along the way (A little church/inn), the grassy plains littered with forests becomes a desert littered small sandy mountains. It didn’t take me long to get poisoned by one of the many snakes and scorpions encountered in the desert, so we rusheded to Triet. Lloyd and Genis enter Triet, the Desert Oasis. and see, gasp, Desians! They put up a wanted poster that looks pretty hilarious, and Lloyd wonders if he’s really that ugly. Lloyd is a little worried, but honestly, what is that expression even? “Don’t worry, they’ll never find you with this.” Genis reassures him. Well, we set out to find out where the Chosen and her group went. A fortune teller, charging us 100 gald might be able to tell them, but… I didn’t have the money after all my shopping! I sell a healing gel and try again. “Are you sure?” Genis asks. Slightly vexed, Genis and Lloyd exit the town and run into… Desians! They capture Lloyd and Genis and take them to the Sylvarant base! 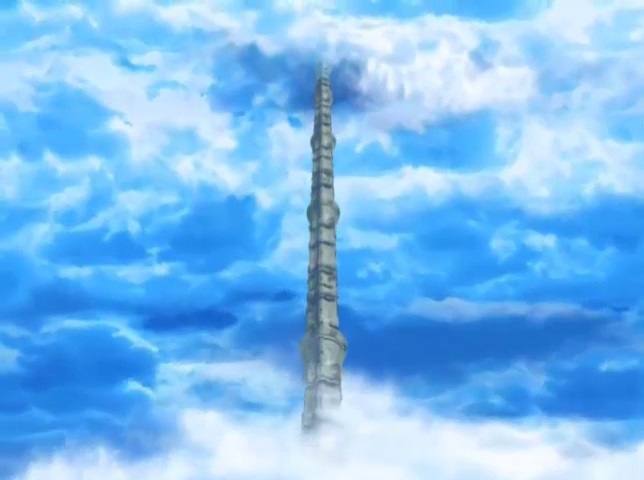 Genis convinces the Desians that he wasn’t on the poster, so he should be set free. Then, he takes Noishe and runs. Lloyd wakes up in a high tech prison. He has no equipment, except for… the Sorcerer’s ring! Awesome! He burns the guard patrolling, then opens the door. (Not sure why the cell doors don’t lock, there’s a button to open them in arms reach.) He gets his equipment then goes outside of the prison room. Before he can though, the guards catch up, and there’s a fight. The alarm sounds and Lloyd runs out of the only door. He arrives in another high tech room, this one’s big with an odd piece of machinery in it. Interacting with it changes the bolt of fire to a ball of electricity that floats forward then hovers for a second. The Sorcerer’s ring does more than shoot fire and freeze enemies! It’s actually also another point of interaction for puzzles. In most games that don’t have overworld item use, you can really only use one button to interact with the world. Maybe two if there’s an attack button. Symphonia added the Sorcerer’s ring as another way to interact. Now puzzles can be more complex because there are more options the player has to consider. Further, puzzles are always fresh and new because the Sorcerer’s ring’s function changes in nearly every dungeon, and to suit that dungeon’s theme as well! Desians, heeding the alarm that was set off earlier, rush into the room. Lloyd hides by hanging off the flooring down into a large indent in the centre of the room. Lloyd comments as he climbs back out. It seems the Desians had to electrocute two of the defensive robots over blue pads in order to open the door. This is an exsphere puzzle, and it’s a real pain to do. Took me a lot of tries because the machines don’t like to stay electrocuted for long enough! Anyway, afterwards he explores the rest of the Sylvarant base, finding another puzzle with a giant GameCube in the centre. Honestly, I find this pretty funny. Correctly completing the puzzle sends you to a three way corridor. A lot of Desians run towards Lloyd from the right and he’s stuck turning left to avoid them Then he runs into a room for safety. But instead of safety, he finds the leader of the Base. They both proceed to have the most smug conversation in the entire game, and it’s hilarious. Here’s a screenshot of my favourite line from it all. I actually had a picture of this on my phone, but I lost it. So, his second in command, Lord Botta, enters to defend him. Botta! That’s the guy that attacked the Martel Temple and tried to kill the Chosen at the beginning of the game! He’s the guy with the big curved sword! He says that Kratos is here. Yuan doesn’t want to meet up with Kratos (maybe because he’s so strong? ), so he leaves. Then the rest of the party come in, Genis had left to get everyone else! Awesome! A fight breaks out between the party, Botta, and some Desian henchmen. Not too difficult. Botta uses a big curved sword. instantly that half healths most party members. I beat him after about three tries and a bit of coordination, backstepping to dodge his abilities, and straight up running away whenever he cast the level 2 spell, Stalagmite. Kratos ends the fight by breaking Botta’s weapon. He drops it and runs. Raine takes it, it seems he had an exshpere attached to it to power it up. They head back to Triet to discuss it all. Raine becomes smitten with the exsphere, wondering if she can use it too. Kratos finds a damaged key crest among the pile of artifacts Raine brought along with her. Seems she found it near a ranch. Lloyd offers to fix it, and everyone goes off to their rooms. Lloyd finally confirms with Raine that it’s okay for him to come along. Now I got a chance to talk to other people, with options to change affection ratings. Tales of Symphonia has an affection system built in. It’s much better than a lot of the morality systems built into games nowadays, because it’s more dynamic, and affection is built up over time instead of by big sweeping events. How it works is that each character has a hidden number, and all the choices you make, weather to wait for Raine back at the beginning of the game or ignore her instruction to stay in the classroom, affect people’s ratings. Cooking also effects affection, as well as choosing party members when there’s a split up. Near the end of the game, the person with the highest affection will come to your door. You may turn them down, and if you do it goes to second, then third. (Unless you’re playing the GameCube version, then someone specific shows up third, and the third highest shows up fourth.) 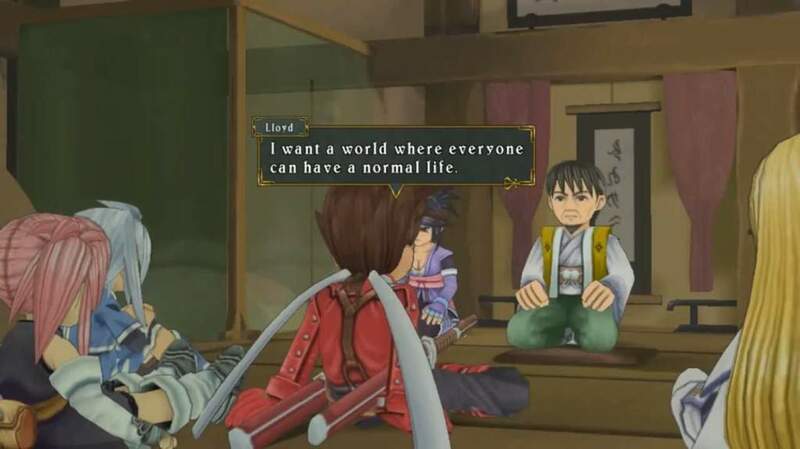 The person you let in gets a special cutscene with Lloyd. Some characters will give him an item, and others will change a major element of the game’s ending. I’ve seen about two endings myself. I have the suspicion that I chose Colette’s twice. I’m interested in seeing Sheena’s, Raine’s, and Zelos’s. Well, all of them really. Anyway, you can interact with other party members to increase or decrease affection during this time in the inn. Genis sleeping, Colette lying awake silently, and Kratos leaving suspiciously. Kratos exits to go talk to Noishe, which is odd because Noishe doesn’t like strangers. Before anything deep happens, Kratos escapes the conversation by telling Lloyd that he still needs to improve and then walking away. After the fight, the party exits and we head to the Seal of Fire. I had to run back to the inn to heal up while doing the temple, as I needed to grind up so enemies weren’t so hard. Someone kept waking Lloyd up, an intruder! Raine says it was probably a Desian, but I don’t know. I think it might have been Yuan after Lloyd’s exsphere or something. To be honest, I’ve played this game three times over and I still am not sure who it was, but Yuan is the best bet. This happens once more before it stops. Right outside the Triet ruins, Kratos teaches the party defensive Techs. Raine and Genis get Force Field, Lloyd gets Guardian, and I don’t remember Colettes. Kratos had Force Field to start. Think of it like super blocking. Blocking stops about half the damage, and it only works against regular attacks. Guardian works against special attacks and regular attacks, and it blocks a lot more damage. These can be the difference between death and survival against bosses with high level spells, especially on higher difficulties. The temple is simple but unique. You have to light torches to raise platforms using the Sorcerer’s Ring. This can cut you off of chests and other things though, so order is important if you want all the goodies. In no time, I made it to the boss and fought some weird fire dog things with even weirder names (Ktugach). It was easier than Botta, but still they were no pushovers. After the boss, we talk to good old Remiel, the monotone angel that might actually be Colette’s real father. With the completion of the first seal, Colette is granted the power of the angels. She gets wings and learns the powerful light magic spell, Angel Feathers. Genis gets really excited about the wings while the rest of the party talks about Remiels hint. It seems the next temple is across the sea. They will have to get a ship. It’s a chilling question. Even remembering it gives me a touch of anxiety. We’re caught up now, so I’d better go play some more so I have something to write about. There’s a high chance that the next one will be Ossa Trail to Izoold, including the infamous Sword Dancer. However, I might skip the Sword Dancer and just move on to Palmacosta. We’ll see! P.S. In case you don’t know what’s going on here, check out what I plan to do with Tales of Symphonia, or the Table of Contents. This page is under construction, but it’s still semi-functional. Terms are NOT in alphabetical order, instead they are in Chronological order. For more Tales of Symphonia content, please visit this page. The Desians are an evil organization run by a group of half-elves. They run human ranches, where they put humans to work, mostly pushing blocks around and whipping them. There are five human ranches, each run by one of the five Desian Grand Cardinals. The journey of regeneration that the Chosen One undergoes does two things, it brings mana back to the world, as well as driving the Desians away. In Tales of Symphonia, Mana is analogous to economic wealth and prosperity. If a place has low mana, such as Sylvarant, then it becomes run down, and regresses technologically. The opposite is true of places like Tethe’alla. Sylvarant is in a particularly bad state because the previous chosen failed their journey and thus the lands have been losing mana to Desians for a long time. Tales of Symphonia has an affection system built in. It’s much better than a lot of the morality systems built into games nowadays, because it’s more dynamic, and affection is built up over time instead of by big sweeping events. How it works is that each character has a hidden number, and all the choices you make, whether to wait for Raine back at the beginning of the game or ignore her instruction to stay in the classroom, affect people’s ratings. Cooking also effects affection, as well as choosing party members when there’s a split up. Lloyd’s mother is dead, she was found outside the ranch by Dirk when Lloyd was around two or three. The story had always been that Lloyd’s mother, Anna, was found dead with him in her arms. The truth is that she was alive, stating that Dirk was to keep the exsphere safe. She must have run off with the gem, and now the Desians want it back. It seems they will fight very hard to get it, because for some reason it’s special. More about Lloyd’s past is revealed in the future, but it’s very important that this baseline is clear. Kratos teaches the party defensive Techs. Raine and Genis get Force Field, Lloyd gets Guardian, and I don’t remember Colette’s. Kratos had Force Field to start. Think of it like a superior block. Blocking stops about half the damage, and it only works against regular attacks. Guardian works against special attacks and regular attacks, and it blocks a lot more damage. These can be the difference between death and survival against bosses with high level spells, especially on higher difficulties.